Giants head coach stepped down on Tuesday after 12 years in charge. Coughlin has been Manning's coach for his entire NFL career. VETERAN NFL COACH Tom Coughlin gave his final press conference with the New York Giants yesterday after the team announced he would be stepping down. Coughlin’s speech was classy, thanking virtually everybody he came in contact with during his 12 years as head coach. One particular moment hit quarterback Eli Manning, who was in attendance for the speech. Coughlin spoke about Eli Manning’s ability to adjust under a new head coach and spoke glowingly of him. The Associated Press’ cameras caught Manning tearing up during the moment. “He’s extremely bright, he’s extremely competitive, he’s what you want a son to be made out of,” Coughlin said. Manning and Coughlin have spent their entire time with the Giants together, with Eli’s rookie year coinciding with Coughlin’s first year as head coach. Manning was understandably upset, as after 12 years, he’ll have a new coach for the first time in his career next season. Email “Tom Coughlin's final press conference brought Eli Manning to tears”. 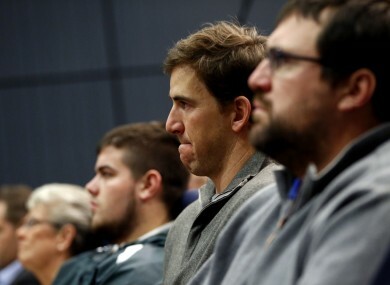 Feedback on “Tom Coughlin's final press conference brought Eli Manning to tears”.